i learned some years ago that making resolutions wasn't for me. i, like 3/4ths of the population, crash & burn in my resolutions by mid-february. but i am not immune to the promise of a clean slate & a fresh start that the new year brings. i went back through my 2011 list, and i was moderately successful in accomplishing some of my goals. i'd like to be MORE than moderately successful, for sure..
but i don't feel like i came into the new year a failure because they weren't achieved..
goals feel like they don't have a set end date. you don't make it that year? aim for it the next. and the next. 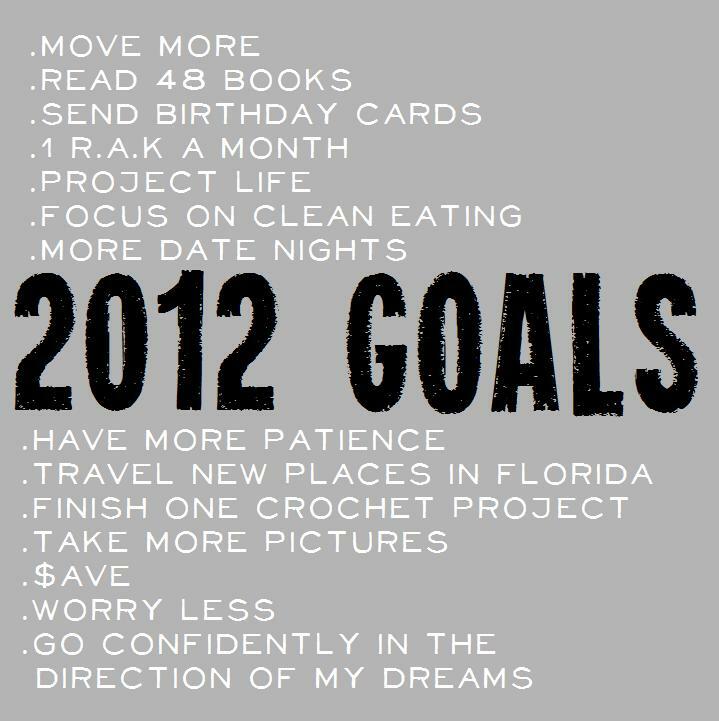 here are my 2012 goals in no particular order..
i've already knocked out 5 books since 1.1.12, thanks to my kindle & free downloads. getting a surprise in the mail is much more fun then receiving a text from a friend on your birthday. yes, i jumped on the project life band wagon. i'm just waiting for page protectors! clean eating. it's a lifestyle, not a diet. more on this soon as well! travel florida. we can't always travel out of state, but we are fortunate enough to have a state full of great places to visit. looking forward to short weekend trips to new places this year! I look forward to keeping up with them!